Sakenet’s sakés can be summed up in 3 words, Junmai, Kan (heated saké) and Jukuséi (aged saké) This Junmai saké (saké made in the traditional way with rice and water only) that develops the depth of its flavour through ageing and saké brings out it’s flavours with heating. To get to the roots of Sakenet and how we got into saké, particularly this type of saké, we must go back to 2001 in a small Yakitori bar called “Toriciya” in Sydney and meet its eccentric owner chef Mr Sakaé Takahashi. Sakaé had been learning about saké through books, and magazines. When he went to Japan he visited saké kuras (makers), saké events and many izakayas. He became infatuated with saké and saké culture. Naturally he wanted to bring the fruits of his travels to Toriciya. Bringing these amazing craft sakés to Toriciya, meant he had to go through the big, Japanese food importing companies, and paying their, generous markup… Sakaé wanted to serve great saké at a reasonable price (as it’s done in Japan). Two very important books in Sakaés saké apprenticeship are “Iza Junmaishu (Junmaishu Now)” and “Junmaishu wo Kiwameru (Mastering Junmaishu)” by the legendary saké consultant Hiroshi Uehara (1925-2006), these books introduced him to many makers and restaurants/izakayas and led him deeper and deeper into the world of Junmai Kanzaké. The ‘ersatz’ saké (saké made with less rice and lots of additives), developed to get through the rice shortage of WWII and the post war period, continued to grow even after the end of the rice shortage. Very few foresaw that this kind cheap, low quality, mass produced faux saké would bring about the decline of saké consumption in Japan, and lead to Japanese people abandoning saké as the national drink. Realising the plight of saké, Mr.Uehara who was technical advisor to several makers in Tottori prefecture, encouraged and assisted them in the revival of Junmai saké making. In Saitama prefecture, Shinkamé Shuzō had been focusing on Junmai saké making since the 70’s and in 1987, against pressure from the government, they became the first all Junmai Saké maker since the war. The head of Shinkamé (and Godfather of Junmai saké) Mr.Yoshimasa Ogawahara (1946-2017) began to actively support and advise other makers who wanted to focus on Junmai saké making. Both believed in the traditional style of saké that opens up its flavours through “Okan” (heated saké) and develops its flavour through ageing. Later these two would meet and create an association for the revival of Junmaishu. This association is made up of makers, restaurateurs and people of the hospitality industry, bottle shops and saké enthusiasts. The decline of saké has been devastating on the industry, and has drastically reduced the number of makers, however for those who switched to Junmai based saké making the impact has been little to none. In 2015, 25 years after they created the association Junmai saké was finally being recognized. When Sakaé got involved in with the association in 2005, the fragrant chilled Ginjō was gaining in popularity and the association came to focus not just on the revival of Junmai but also traditional saké culture “Kan-zaké” (heated saké). Much more wine-like sakés began to appear and even as saké became more diverse, Junmai saké was less than 10% of total saké production, and saké consumption in general was still in decline. Sakaé wanted to do more to help spread the work of the association and the Junmaishu he loved so much. 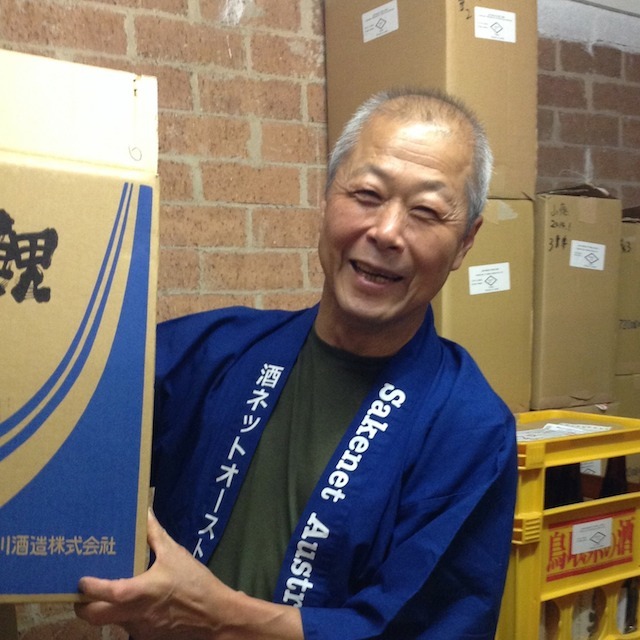 In 2008 he started Sakenet Australia and began importing and sharing junmai saké with his adopted home Australia. Sakaé’s son in law, Taka, has been involved in Sakenet from the beginning, creating the website and the online shopping system. 2011 he spent a year travelling around Europe and in 2012 officially joined the Sakenet team. Taka grew up in a small paper industry town in Ehime Japan. There were 2 saké makers in his town so from a young age he was aware of saké, and the culture of saké and saké making. 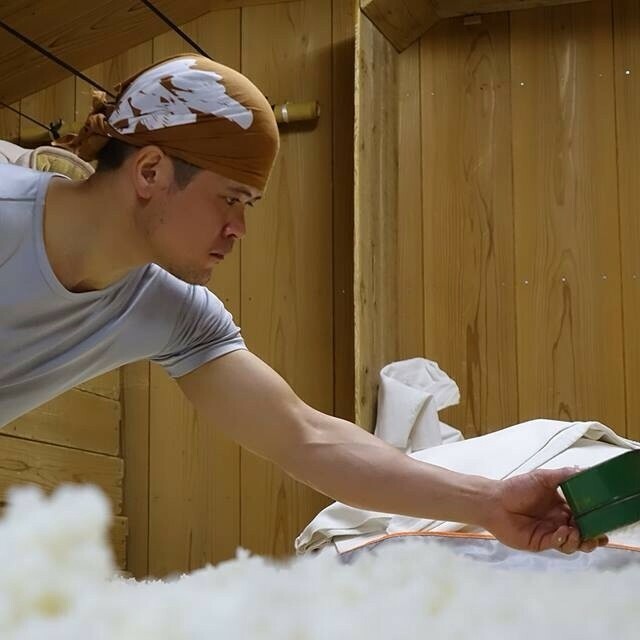 He had a natural love of saké, but joining Sakenet, working with saké on a daily basis, experiencing the life of a kura-bito (saké maker) with Asahikiku really embodied his love of saké. Side note: Coincidentally Taka’s surname is also Takahashi. Sakaé’s eldest son, Rey, was studying Chinese and Kungfu in Fuzhou China when Sakenet started. With the death of his master in 2013, he returned home to help the Sakenet business, making a brief stop over in Tottori Japan to study saké making and saké culture. He spent a year with Hiokizakura working as a kura-bito. 2016 Sakaé retired from Sakenet and handed over the reins to Taka and Rey. Now, more than ever, our focus is on "Junmai", "Kan" and "Jukusei", the traditional saké of Japan, and sharing this amazing culture with the people of Australia. Tell us about your importing business. Which styles, producers, regions, etc. do you seem to focus on? With regards to styles and producers, we deal with producers from all over Japan, however since the Junmai Jukusēi Kanzaké renaissance started in Tottori, we have a lot of producers from the Sanyin region(Tottori and Shimané prefectures) and Western Japan in general. Most of our producers are members of the “Kuramoto Kōryūkai” or the “Zenryō Junmaigura wo Mezasu kai” (roughly translates to ‘Association of Saké producers aiming to be all Junmai sake producers’) Our main conditions for choosing sakés, is that it’s hand made Junmai. It tastes good when heated. It improves with ageing. What are the different styles of sake? Traditionally the ‘style’ of a saké was largely determined by the region and the Tōji(master saké maker) guilds that the local craftsmen belonged to. Now we have special designations like Daiginjō, Ginjō, Junmai and Junmai ginjō etc to classify sakés according to raw materials and how they’re processed. You could also classify today’s sakés into 2 main categories, one being flavour based and the other fragrance based. However we believe the history of the past 100 years has had a big influence on the different saké styles of today. The saké of the feudal Édo period is believed to have been quite sweet and rich (There’s no way to know for sure, but several makers have attempted to historical recreations of sakés by following recipes from the times, and the result was rich and sweet!). There are records of scientific analysis of sakés from the late 19th Century, the Meiji period, by English scientists and on paper they seem to be very dry and quite high in acidity. Shortly after, around 1910, saké making takes a big leap forward, as recent developments in microbiology are incorporated into traditional saké making techniques. In the late 70’s Saké consumption in Japan begins a sharp decline. To put a stop to this, the industry starts a campaign to promote the “tanrēi-karakuchi” (light and dry) style. The tanrēi-karakuchi boom also introduced the fad of drinking saké cold. As Japan continues its economic recovery the more expensive ‘Ginjō’ saké becomes popular, this leads to the popular belief (and we believe misconception) that the main characteristic of saké are the fruity and fragrant aromatics. In the 21st century the saké industry has been consciously trying to enter the ‘wine’ market by focusing more and more on the aromatics of Ginjō saké through development of specialist fragrant yeasts, and establishing the wine glass as the main stream way to enjoy saké. New fruitier juicy Ginjō’s has made saké popular among younger people and women, 2 demographics that were not big drinkers of saké. Parallel to these trends has been a small number of makers bringing back pre-industrial techniques, and attracting attention to the rich full bodied but dry style of saké. These sakés didn’t just suddenly appear in 2010's, but have been developed by small group of dedicated makers like Shinkamé and Mr. Uehara since the 70’s. In summary there are 4 main styles of saké. 1980(late)~ Ginjō, and fragrant sakés made with fragrance specialist yeasts. 2010~ Sweet and juicy Junmai style. 2010~ Rich full bodied dry Junmai. This is a ‘retro’ style was originally popular in the late 19th century and early 20th century. It has been reborn since the 70’s. Which style is your favourite? Why? Do you have a favourite producer or region, too? Sakenet is dedicated to deep full-bodied ‘flavour’ based sakés. Taste is important, but we love makers who are tackling the challenges of the future of saké. Makers who remember the traditions and are working to express the traditional culture in a modern context. Sake is known as Japan’s rice wine, but is it similar to wine? What are the core differences and similarities? As a fermented alcoholic drink, in some respect saké is very similar to wine and beer, but there are also many differences. The main, and obvious, difference being the different ingredients and the challenges that go with fermenting those ingredients to produce alcohol in the form of a delicious beverage. The historical background of saké plays an important role in shaping the development of saké. For a long time Japan was isolated from the world, and just like Japanese culture, saké was allowed to follow its own unique evolution. That means that saké can be difficult to understand by other cultures, however there is also something very attractive about its mysterious foreigness, and possibly one of he main reasons why saké is attracting so much attention today. The difference between saké and wine (or saké and everything other drink) is a difference of culture. As far as similarities go, both saké and wine are drinks to be enjoyed with food. We believe it’s because they are accompanying our daily bread that both have become such an integral part of their cultures. Finally, we think the term “rice wine” is very problematic. Just as beer is not ‘barley wine’, saké is not ‘rice wine’. We understand how the term came about, but we believe it doesn’t help people understand saké, especially people who are new to Japanese and Japanese culture. To a westerner ‘wine’ has a specific meaning, and simply put saké is not wine, saké is saké and it should be allowed to stand on its own merits. What makes a good sake? What do you look for? Of course it goes without saying that good quality rice, water, the right equipment and environment and knowledge and skill is a must to make good saké, however we believe the search for good saké begins with the search for good people. 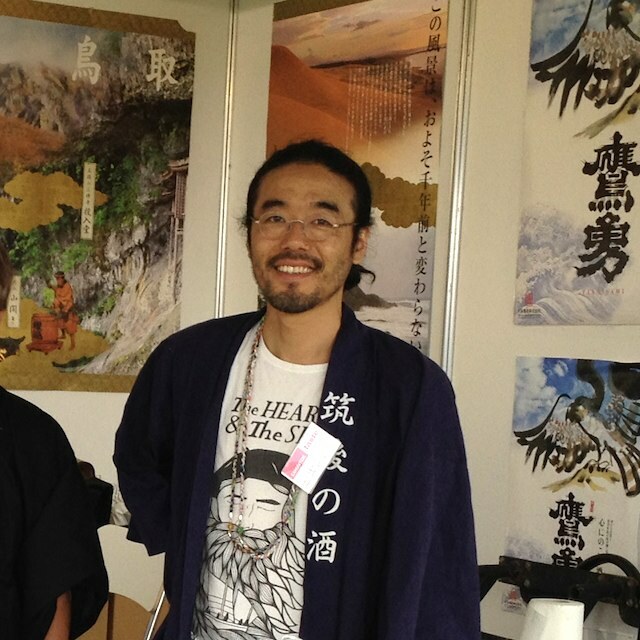 People with vision, desire and love for saké and saké culture. We love the saying “和醸良酒- wajōryōshu” (which roughly translates to “harmonious saké making = good saké”) saké making is a team sport and it takes a group of individuals to work together, in harmony, as one to make great saké. The “心-kokoro-heart” of the team and the individual is just as important as technical skill. Best sake and food match? Japanese saké can be matched with a surprisingly wide range of foods. Food matching sounds difficult but the flexibility and accepting nature of saké means you can give it a go with almost anything. When it comes to matching Sakenet’s full bodied Jukuséi-junmai-Kan-saké (aged Junmai saké served heated), it’s hard to pick the ‘best’ but since we’re in Australia, it’s hard to go past our amazing artisan cheeses. The great fermenting culture of Japan and Australia coming together to create a little magic is a lovely story and an awesome experience. It’s only in the last 30 years or so that saké has begun to be drunk cold, before that saké was enjoyed heated, to varying degrees. Traditional style saké was made to be enjoyed heated and is much better that way. The modern style saké is probably better cold. Sakenet loves, old skool, traditional saké so we have our saké hot hot hot. What’s the most surprising thing you’ve learned about sake? We believe learning about saké is learning culture, and learning culture is learning about people. Time and time again we are overwhelmed and moved by the work, the dedication of people of the past and the present. To enjoy saké, to know saké isn’t just about a drink, there are so many other cultures, traditions, skills and people involved. The farmers who grow the rice, the craftsmen and women who make the saké, the chefs who present the saké matched with delicious food, and the people who enjoy the saké. There are so many elements that need to come together to create this culture of saké, and that this saké culture is just one part of Japan’s food culture and Japanese culture in general. It’s fascinating how each work together, and how learning about one helps you better understand the other. or to obtain alcohol on behalf of, a person under the age of 18 years.